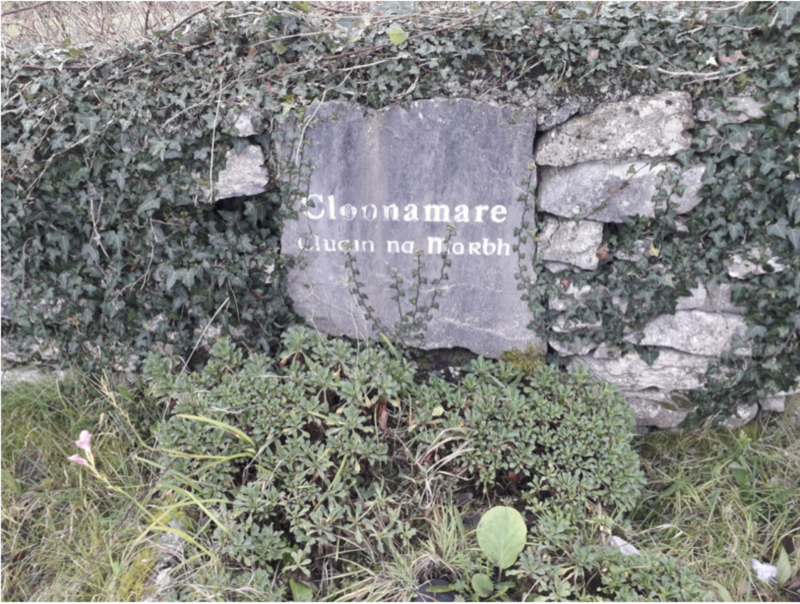 According to O Donovan’s Field Name Books 1838, the standard name given to the townland was Cloonnamarve and Cluan na marbh was its official Irish name. Other names this townland was given were Cloonnamarriv recte Cloonamarve (O Donovan’s Field Name Books), Cloonnamorriv (County Cess Collector), Cloonamorrive (County Map, Mearsman), Cloonamorriv (County Surveyors Sketch Map, Rev. Michael Waldron, P.P. ), Cloonamorriuv (Local), Cloonamarra (Tithe Ledger) and Cloonnamarve (Logainm.ie). 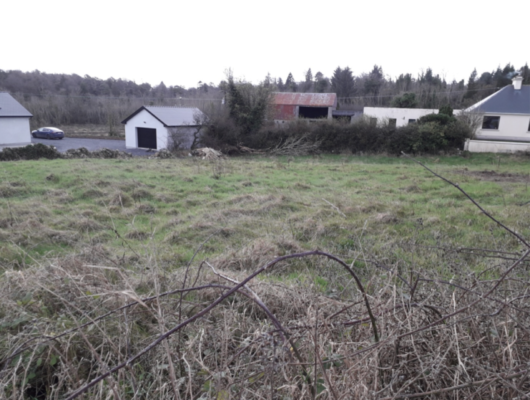 This townland is situated on the East Side of the Cong Parish. Cloonnamarve is bounded on the north by the Parish of Cong, Mayo and Clegdothia (sic. ), bounded west by Clegdothia (sic.) and Tubberrogue, bounded south by Clogher and bounded east by Creg. The Down Survey was a cadastral survey of Ireland carried out by William Petty, English scientist in 1655 and 1656.The survey was apparently called the “Down Survey” by Petty because the results were set down in maps; ‘admeasurement down’ was used; it is referred to by that name in Petty’s will”. (Wikipedia). The name used by the Down Survey for this village was Cloonenamarue. In 1641, the owner was Teige Oge O’Flahartye (sic.) who was a Catholic. In 1670, the owners were John Darcy who was a Catholic and Dominick Browne who was a Protestant. There were 39 acres of profitable land and 39 acres of forfeited land. The proprietor for this village was Lord Oranmore, Castlemontgaret. The agent was Jerrard Strickland, Esq. Loughglynn, Co. Roscommon. According to O’ Donovans Field Name Books, this townland was composed of 68 acres, 0 roods and 34 perches. Farms were about 39 acres. This village was held under lease by Rev. Michael Waldron. Co. Cess paid 12¼ per acre for 39 acres. The rent was £24.0s.0d. per year for the farms. The soil was mostly rocky. The arable part produced a pretty crop of oats which were not heavy. In some parts of the village there was nothing but a sheet of rocks. There is also a pigeon hole here with a subterraneous stream. According to Griffiths Valuation, Cloonamarve had a total acreage of 68 acres, 1 rood and 30 perches. The total valuation for this town land was £20.10s.0d. Benjamin L. Guinness was the immediate lessor for this townland. This plot was divided into 2 plots. Plot 1 was comprised of 65 acres, 3 roods and 35 perches. This plot belonged to William Gallagher. Total valuation for this plot was £18.15s.0d. Plot 1 William Gallagherhad an office and land. The land was valued at £18.10s.0d. and the buildings were valued at £0.5s.0d. Total valuation for this plot was £18.15s.0d. Plot 2 was composed of 2 acres, 1 rood and 35 perches. This plot belonged to Honoria Burke. Total valuation for this plot was £1.15s.0d. Plot 2 Honoria Burke had a house and land. The land was valued at £1.10s.0d. and the house was valued at £0.5s.0d. Total valuation for this plot was £1.15s.0d. There were two houses in this village and one of them was inhabited. House numbered two was not inhabited and was owned by Lord Ardilaun (sic.) There were two males and two females in this village according to the Enumerator’s Abstract (Form N). Everyone in this village was Roman Catholic and were born in Galway. This village had one piggery and a barn according to the Return of Out-offices and Farm- steadings (Form B.2.) for 1901. Patrick (63) and Catherine (54) Jenningslived in house 1 with their two children. Their children were Barbara (24) and Edward (21). Patrick was a farmer and Edward was a labourer. Everyone in this household could read and write. Everyone in this household spoke Irish and English. They lived in a 2ndclass house with three rooms. They had a piggery and a barn. Ten years later the census questions were expanded to include the following: Particulars as to Marriage (which included – completed years the present marriage has lasted, children born alive to present marriage, total children born alive to this marriage, and children still living). There were two houses in this village and both of them were inhabited. House numbered 1 landlord was Lord Ardillaun (sic.). There were five males and three females in this village in 1911. Everyone in this household was Roman Catholic. There were two calf houses, a calf house, a piggery and a fowl house according to the Return of Out-offices or Farm-Steadings (Form B.2.) in 1911. Martin (39) and Bridget (38) Gibbons resided in house 1, this was a new household in this village in 1911, with their four children. Their children were Martin (7), Mary (5), John (3) and Catherine (2). Martin (Snr.) and Bridget were married for nine years, had four children and four of them survived until 1911. Martin (Snr.) was a rabbit trapper. Martin (Jnr.) was a scholar. Bridget and Martin (Jnr.) could read and write. The rest of the household could not read or write. The parents and Martin spoke Irish and English. The rest of the household spoke English only or were too young to talk. The parents were born in Mayo, the rest of the household was born in Galway. They lived in a 2ndclass house with three rooms. They had a cow house and a fowl house. Patrick Jennings (78)lived in house 2, previously numbered house 1, with his son, Edward(33). There was no mention of Catherine or Barbara in this 1911 census. Patrick was a widower. Patrick was a farmer and Edward was an agricultural labourer. Both Patrick and Edward could read and write and spoke Irish and English. According to the 1911 census of this townland, Patrick was born in Mayo and Edward was born in Galway. They lived in a 2ndclass house with three rooms. They had a cow house, a calf house and a piggery.